And trade is art, and art’s philosophy, In Paris. From Jean Paul Sartre and Simone de Beauvoir to Johnny Depp and Robert de Niro, one small Parisian eatery has attracted the presence of artists, writers, thinkers, and creators for centuries. 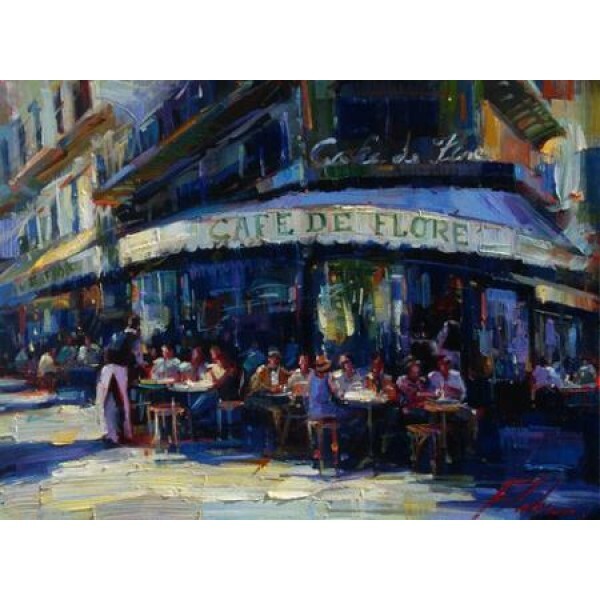 Today, contemporary oil painter Michael Flohr joins the ranks of those who have found a home amongst the historical environs of Café de Flore and memorializes its presence in an oil painting as only he can render. Since the late 19th century, Café de Flore has resided on the Boulevard Saint-Germain in Paris. A corner café with its Art Deco style interior, Flore offers its visitors a view into the historically significant café lifestyle for which Paris is known. It is an archetypal landmark of the French capitol, signifying freedom of expression and creation. True to Michael Flohr’s contemporary impressionist style, the artist applies bold, colorful brushstrokes, capturing the afternoon light filtering down upon the iconic boulevard. Savoring beauty in tradition, Café de Flore evokes a nostalgia for years gone by and a romantic hope for those to come. The establishment’s guests temporarily reside below Flore’s signature awning, their faces remaining anonymous to the viewer. They are the artists of yesterday and today: contemporaries amongst the ghosts of artists past. Imbibed with creative thought, Café de Flore is where great novels are conceived over coffee, timeless images sketched out on a humble notebook, and poets scribble verses and epics. Under the sign of “Flore”, Flohr pays tribute to his namesake and continues to ensure the success of the creative arts.